A limited release fresh-hop beer, Independence Hop Ale was brewed in two 50-barrel batches, following the harvest cycle of the hops. The first batch was brewed with 500 pounds of fresh, unkilned Centennial hops. The second was brewed a week later with 750 pounds of wet Cascade hops picked, stuffed into sacks, driven 77 miles to Newport and tossed in the brew kettle before they had a chance to start drying. After fermentation, the two batches were blended together. The result is a light copper-colored, unfiltered ale marrying the two distinctive hop characters of each batch. Independence Hop Ale is brewed with 8 ingredients: Two-row, Munich, Caramel Wheat and Carafoam malts, fresh, unkilned Centennial and Cascade hops, proprietary Pacman yeast and free range coastal water. 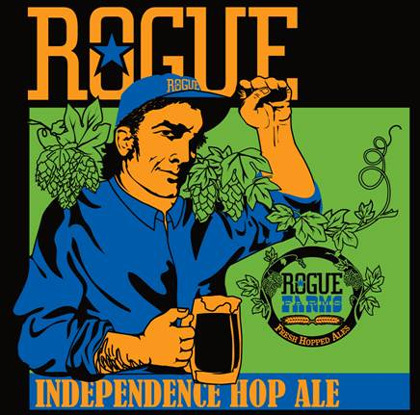 In May of 2008, Rogue entered into a strategic alliance with heritage hop growers the Coleman family. Rogue planted 22 acres of hops and will add 20 more this fall on the former John I. Haas Alluvial Hop Farm just south of Independence. The land, at the end of Wigrich Road, is part of a historic hop farm called the Wigrich Ranch, that in the 1920s was the largest hop yard under a single trellis in the world. Rogue Farms’ hop yard puts the brewery in the position to be able to brew beer with proprietary hops, much like wineries are able to make estate wines. That means from bine to bottle, from plant to pint, beers with Rogue Farms on the label will be 100% pure Rogue. Rogue hops will be picked, kilned and baled on site. In 2009, Rogue will add proprietary malted barley from Rogue Farms’ newly acquired barley farm near Tygh Valley, Ore. for a beer made with all-Oregon ingredients to celebrate Oregon’s 150th birthday. Independence Hop Ale will be available in Oregon and Washington in serigraphed 22-ounce bottles and on draft while supplies last. The Rogue Post Office has issued a commemorative stamp in honor of the hop farm and has a 24-hour webcam where Rogues can watch the Rogue hops grow. As an Oregon drinker I have enjoyed Rogue beer for many years.